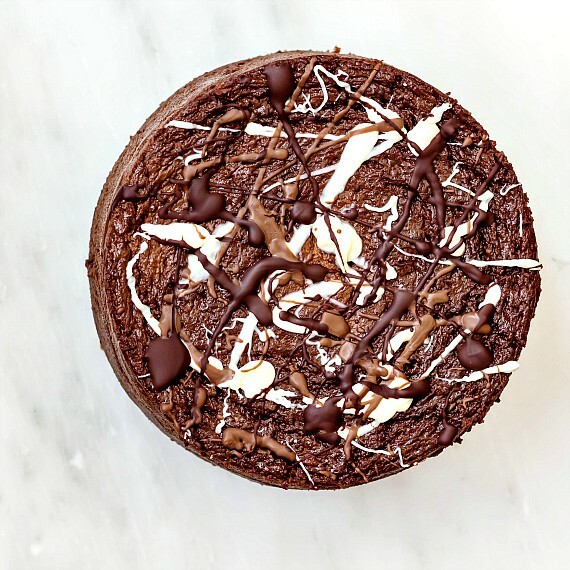 Chocolate lovers, this double chocolate cheesecake is for you. Want a truly eyes-rolling-back-in-your-head experience? Serve it slightly warm. Enjoy! I have always loved cheesecake, and almost any kind will do. New York Cheesecake, ricotta cheesecake, Cheesecake Factory Cheesecake. Even the no bake kind–even the Jell-o No Bake kind–is totally fine with me. I find something to love in every cheesecake. I’m an equal opportunity cheesecake lover. I don’t know how chocolate cheesecake got the reputation of being stuck in the 80s or 90s. Sure, it was really popular then, but why shouldn’t it still be popular today? 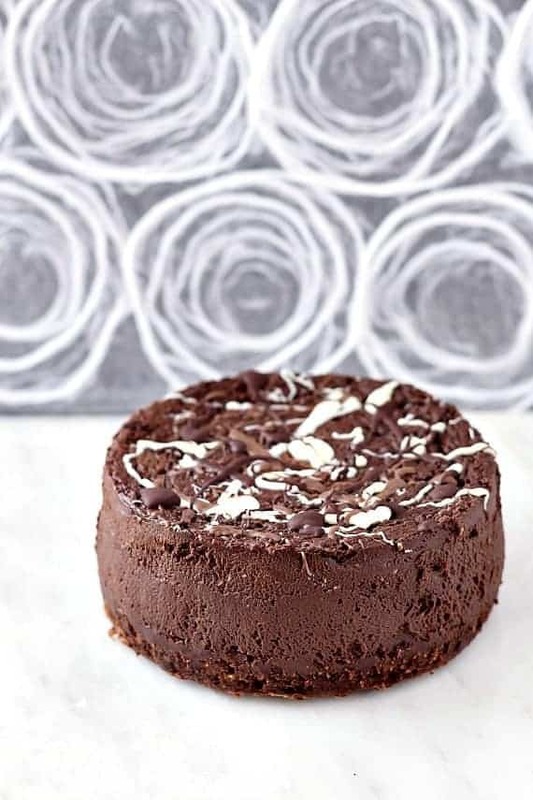 While some preferences in the 80s and 90s were…questionable and best left back in the decades that celebrated neon excess, there is no reason why we shouldn’t make a place in our hearts and our kitchens for double chocolate cheesecake now. Sure, it’s a bit excessive, but it’s also delicious. 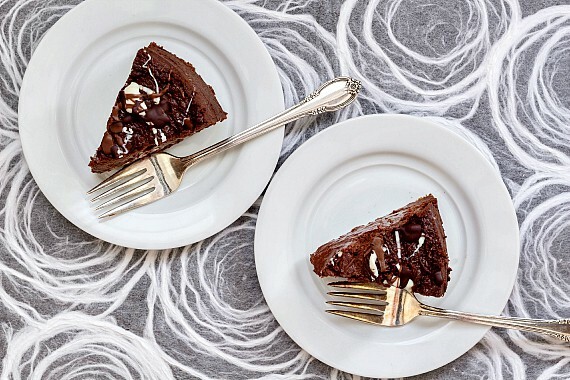 Rich and decadent double chocolate cheesecake is calling your name. Can you hear it? 1.1 Note the smooth, beautiful top under all that chocolate spatter action. 4 Can You Serve Cheesecake Warm? 4.1 Look at that interior texture! Irresistible, no? To help pull chocolate cheesecake out of the over the top 80s and 90s, lose the poofy whipped cream trim and the riot of chocolate curls and ganache oozing down the sides and the pile of mini Reese’s cups in the center. 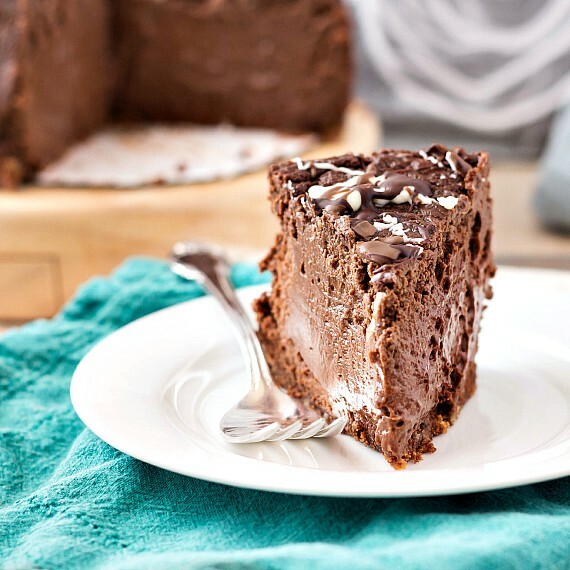 Chocolate cheesecake doesn’t need all of that embellishment. Embellishment is often redirection from a boring recipe. Chocolate cheesecake is far from boring, so let it shine. A thin chocolate crumb crust is really all it needs. I did channel my inner Jackson Pollack with some splatters on the top of my cake in dark, milk and white chocolate. I think it looks pretty sleek and awesome. Note the smooth, beautiful top under all that chocolate spatter action. 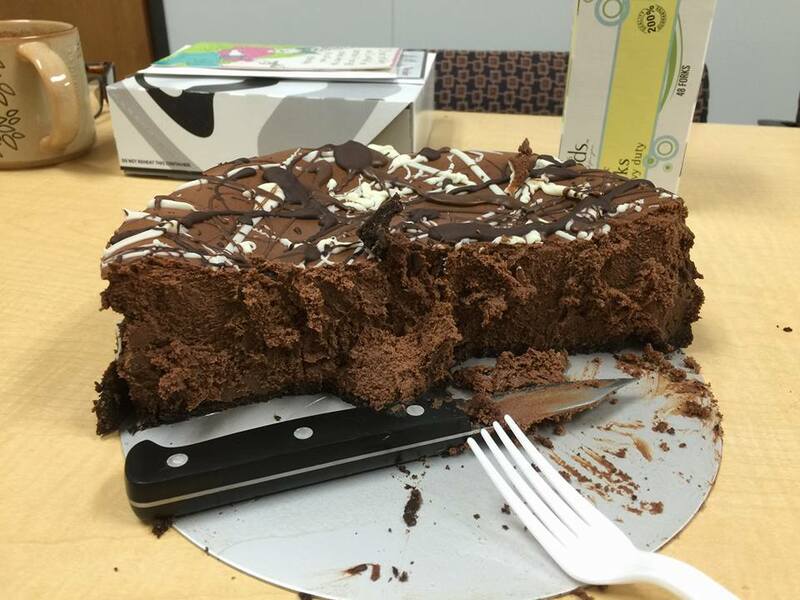 On Monday, I made a large cheesecake for Neighbor Thomas to take to work for a co-worker’s birthday, so I endeavored to make the best chocolate cheesecake possible. Once I decided it needed to have both bittersweet chocolate and cocoa powder in it, it turned into the best double chocolate cheesecake. 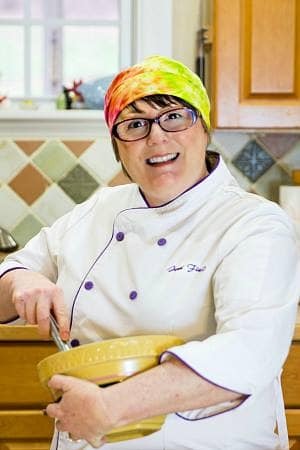 I posted photos and folks asked if I’d be sharing the recipe. I decided I needed to make another cheesecake for the blog, but I didn’t need a mammoth one like I sent with Thomas. So I made a wee-ish one instead. Besides, I wanted to test out baking it in my pressure cooker. That had come up quite recently on facebook, and I thought it’d be fun to give it a shot. I mean, it makes sense to have a cheesecake bake in a very moist, 250F environment. No way it could crack, right? 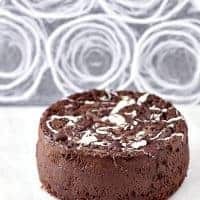 I have to work on the formula for making chocolate cheesecake in the pressure cooker so the top will be smooth, but the texture and flavor were spot on. While my guy didn’t crack, his top was sort of craggy. I was a bit dismayed since I wanted a smooth top, and my conventionally baked cheesecakes all have a beautiful smooth, flat (or at least flattish) top for optimal Jackson Pollacking. I posted a photo of this guy right out of the pressure cooker, and friends weighed in. Covered pan versus uncovered pan. High pressure versus low pressure. Ratio of sugar to fat. This last from Mark Scarbrough, one of the authors of The Great Big Pressure Cooker Book. I was intrigued since I look at pressure cooking as just another cooking method as opposed to something I’d need to adapt all my recipes to use, you know? But, upon reflection, it does stand to reason. The moist environment is very different from the dry environment of the oven, and a pressure cooker’s locking mechanism doesn’t allow for evaporation, either from the cooking liquid or from the food itself, so one has to make allowances for that pretty crucial factor. I summarily ordered Mark and Bruce’s book that I might learn more of the science of pressure cooking and how to adapt my recipes to that cooking method. While I don’t love the look of the top of the cake, I Jackson Pollacked it up anyway and put it in the fridge to chill. Optimally, I’d chill it for at least four hours before cutting, but I’m impatient and was only able to wait one hour. Can You Serve Cheesecake Warm? You do want to make sure it’s not hot or you won’t be able to slice it. The interior texture was absolutely smooth and dreamy. Like pudding. If that’s your thing, I highly suggest you serve this cheesecake slightly warm, at about 90-100F in the center. After chilling overnight in the fridge, I sampled the cake again. Still smooth and dreamy, but firmer since it was completely chilled. Just as delicious. Look at that interior texture! Irresistible, no? I’m providing the method for baking this cake in a conventional oven, but I’ll also add the how-to for baking it in a pressure cooker for those of you who don’t care that the formula isn’t perfected for that method. Just call it Old Rocky Top! If you dig the sound of a double chocolate cheesecake, please consider rating and/or commenting. I love to hear from readers! And if you make it, and I hope you do, please share a photo with me on instagram by tagging @onlinepastrychef and using hashtag #pcorecipe or in the Pastry Chef Online Facebook group. I can’t wait to see your version! 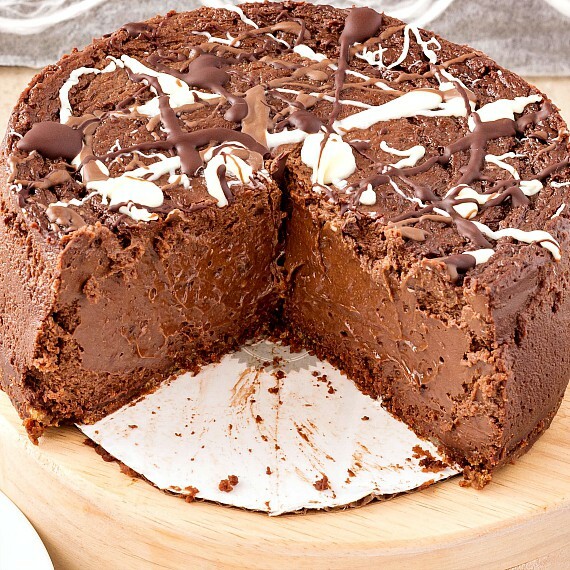 This is honestly the best double chocolate cheesecake you will ever have. It is rich, creamy and decadent. I'm providing directions for baking in a conventional oven, but check the notes for how I did it in the pressure cooker if you feel like giving that a shot. Use your favorite chocolate crumb crust. 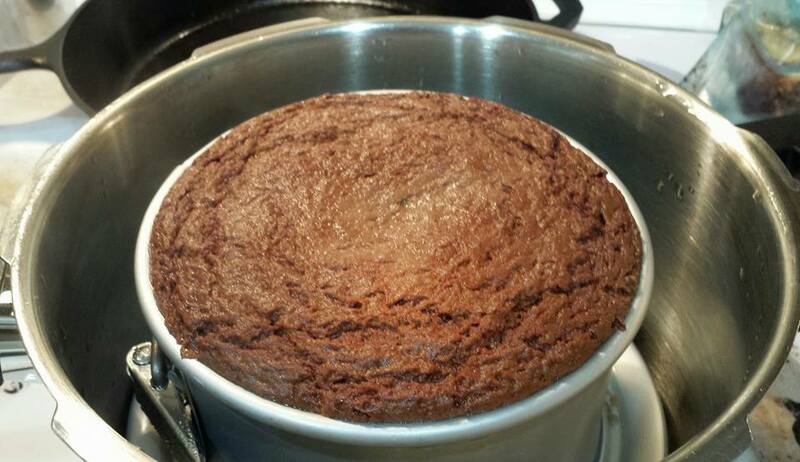 This recipe makes 1 6" x 3" cake and will serve 6-8 people. Feel free to double it to serve 16. In that case, you'll need a 9" x 3" springform pan for baking. No hard math for scaling--just double everything and it'll work out fine. 1 1/2 teaspoons instant coffee dissolved in 1 1/2 teaspoons water or use 2 teaspoons coffee extract if you have some. Feel free to do your own thing. If you want yours to look like mine, , you'll need about 1/2-1 oz each dark chocolate, milk chocolate and white chocolate, melted. Spray a 6" x 3" springform pan with pan spray. Cut a parchment circle to fit in the bottom of the pan. If you don't have a leak-proof pan, wrap the bottom and sides of the pan tightly in a double layer of heavy duty aluminum foil. Combine the cookie crumbs and the butter until the crumbs are evenly moistened but not greasy. They should hold together if you squeeze a bit. Press them evenly across the bottom and maybe 1/2" up the sides of your prepared pan. You can bake it at 350F for 10 minutes, but I didn't this time and it worked out just fine and saved me 10 minutes of oven time. Your choice. Preheat the oven to 325F. Place a large cake pan or roasting pan on the center rack. It should be large enough to hold the 6" pan with about 2" clearance all around. Put some water on to boil, maybe 2 quarts. Cream the cream cheese on low speed until completely smooth, scraping the bowl as necessary. Add the sugar, salt and vanilla and continue to cream on low speed until the batter is smooth. Scrape the bowl as necessary. Add one egg and mix completely into the batter. Don't forget to scrape the bowl. Add the other egg and mix completely. You're scraping the bowl, right? 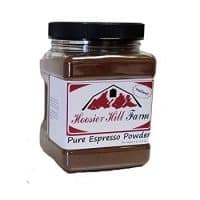 Add your homemade coffee extract (the instant coffee dissolved in water). If you own coffee extract, use 2 teaspoons of that instead. Whisk the sour cream and cocoa powder together thoroughly. It will look like it won't want to mix, but keep at it. What you end up with will look like chocolate whipped cream. Add that mixture to the bowl and let it slowly incorporate. Scrape the bowl, people. All the way to the bottom. Pour in the lovely melted and cooled chocolate and mix just until incorporate. Scrape the bowl and stir by hand to make sure all the batter is chocolatey and delicious. Pour the batter into on top of the crust. It will come up to within about 1/2" of the top of the pan. Pull out the oven rack with the large pan on it. Place the filled pan in the larger pan and then carefully pour the boiling water in the larger pan, allowing the water to come about halfway up the sides of the pan. A little less isn't a big deal, so don't sweat it too much. Carefully push the rack back into position. Bake until the center of the cheesecake reads 155F-160F on an instant read thermometer. If you don't have an instant read, bake until the edges of the cheesecake are firm but the center 2-3" is still a bit jiggly. I can't really give you a time for this, but I'd check it at 45 minutes and then go from there. Once your cake has hit the magical temperature, carefully remove it from the hot water bath--leave that bath right where it is until it cools off--and place it on a wire rack. After about 10 minutes, run a thin knife or spatula around the inside of the pan to make sure the cake hasn't stuck anywhere. Allow to cool to room temperature, decorate as desired, and then chill until cold, at least 4 hours. Melt each chocolate in a separate little dish. 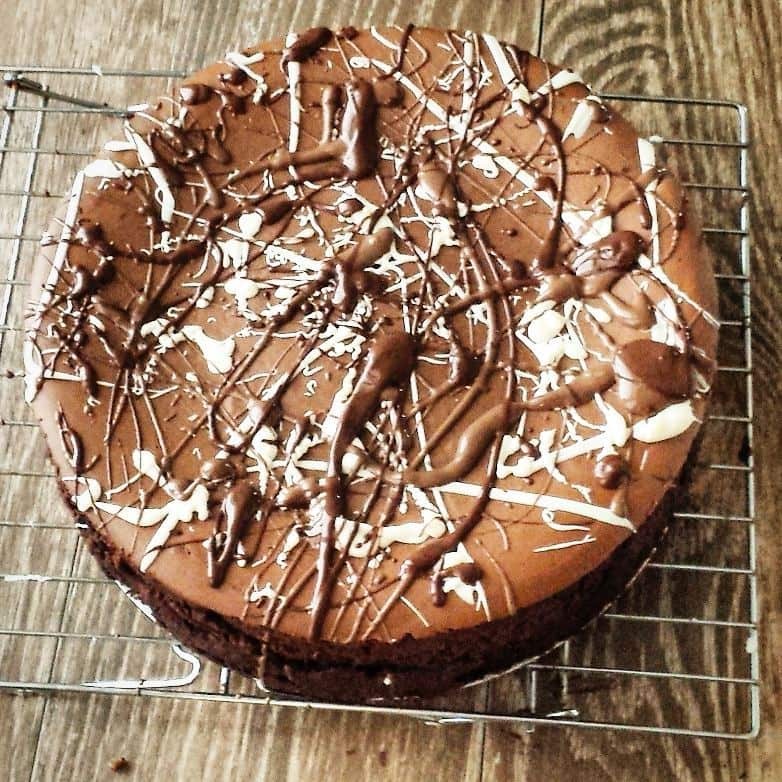 Using a spoon, fork, paintbrush or whatever, grab some of one chocolate and flick it onto the cake. Dribbles, dots, slashes, swirls--anything goes. Repeat with the other two chocolates. Admire your work. For best flavor, allow cake to temper on the counter for a good 1 1/2 hours before slicing. Place a trivet or a small rack inside your pressure cooker. Add 2 cups of water. Fashion a long sling out of heavy duty aluminum foil folded over longways a couple of times. Drape that over the trivet/rack and up the sides of the pan. This is what you'll use to remove the pan after cooking. 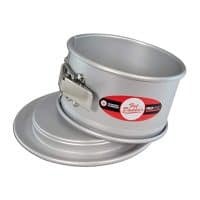 Place the filled cake pan on the trivet/rack, attach lid and heat on high until you achieve high pressure. Moderate the heat to maintain that pressure for a total of 20 minutes. On my electric range, that meant 2 minutes off the heat, 2 minutes on the hot-but-off burner and then 16 minutes at medium-low heat. When the timer goes off, remove from the heat and let the pressure release naturally, about 7-10 minutes. Remove the lid carefully and use the sling to lift your guy out and place him on a rack. Cool to room temperature, decorate and then chill. For a super duper treat (either with the pressure cooker method or with the oven method) eat a piece just barely warm. Heaven. I mean to tell you, this is one fine cheesecake, and one I’ll be making again and again for special occasions. I truly hope you enjoy it as much as we did and as much as Neighbor Thomas and his work friends did. See how they massacred devoured it? Don’t worry, I saved a piece for you guys, too. Chocolate cheesecake slices like a dream! Thank you so much for spending some time with me today. Enjoy the cheesecake, and have a lovely day. Yes! This is what this girl NEEDS right now. Have at it, Cassandra! Good stuff! Yumsters!!! Can I incorporate a layer of cake with it or is it too soft to try? I think that would be fine, Elsie. 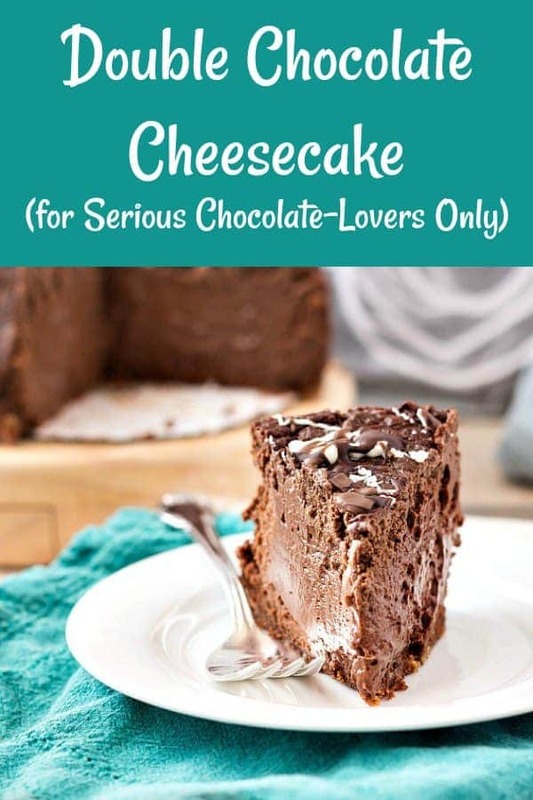 If you make a cake layer in say an 8″x3″ pan (as opposed to the 6″ pan called for), you could then add the cheesecake mixture on top of the cake layer and bake the whole shebang in a water bath so you don’t dry out your cake layer. Let me know if you give it a shot! So, for a normal size Springform pan, do you think simply doubling the recipe would work? It really looks delicious, scrumptious, irresistible! Jus tmade this today in my Instant Pot. First ever cheesecake I’ve made, it came out perfect and there was lots of good cussing when eating about how good it is! I cooked for 30 minutes on manual in my IP, then released for about 10 minutes. Thank you!! This comment made my day, Rebecca! Good cussing is the very best kind of cussing and the highest compliment! So glad you guys like it, and congratulations on making your first ever cheesecake! I don’t know for sure because I haven’t tested this recipe in an InstantPot. My guess is that it will take about 25 minutes and then natural pressure release. 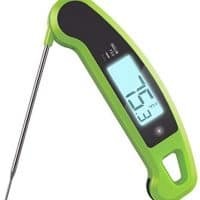 You are shooting for an internal temperature in the center of about 155F. Hope this HELPS. Enjoy!